November 2003 marked the one-year mark of my long-distance courtship with lovely Verónica, the Chilanga of Four Days in Cuernavaca fame. We chatted online every day, and spoke on the phone about once a week. I was 28 and thought she was the one. I took off the Wednesday before Thanksgiving and hopped on a red eye for the 3.5-hour flight to Mexico City’s Benito Juárez International Airport (MEX), marking the start of my third trip to Mexico in 12 months. Vero had to work during the first day of my visit, so I spent it with her parents instead, who didn’t speak English. My Spanglish attempts at conversation seemed to work, for they were kind and amiable hosts. I played with the family dogs and was gifted a bottle of tequila by Vero’s father. The only member of the household to vocally disapprove of me was Loreto, the family parrot. “Green go home,” he squawked. Vero and I spent an evening that stretched on forever walking around the south of Mexico City. We enjoyed cerveza con vino – literally “beer with wine,” and better than it sounds – at a Coyoacán watering hole, and coffee at Café El Jarocho, the colonia’s best coffee shop. I think we may have even gone to the cinema. The next afternoon we boarded a bus for Puebla, the capital of same-named Puebla State, and the third-largest city in Mexico. Though just two hours away without traffic, it took us over three hours to get there. I remember looking out the window and watching what seemed like one out of every three cars hauling a Christmas tree on its roof! We stayed at Hotel Puebla Plaza, a three-star hotel just one block from Puebla’s enormous cathedral. After checking in, we set out for lunch and an evening stroll. I was curious to try mole poblano, the region’s most famous dish. Does succulent, skinless chicken, covered in a spicy chocolate sauce over a bed of rice, sound like something you might like? It certainly sounded like something I would like. We found a restaurant a few blocks away that served mole. Although locals considered it merely average, I found every bite to be sublime. I wish I could remember the establishment’s name, to give it a proper recommendation. We paused in front of the cathedral to enjoy its nighttime illumination. A Christmas tree in the adjacent square completed the ambiance, and we opted to turn in for the night. Well, after getting down to some long-overdue “time well spent,” if you know what I mean. All I’ll say is that during our high altitude throes of passion, the elevation lent me a severe nose bleed. Our next day was spent day tripping to the nearby pueblo mágico (magic town) of Cholula, so close to Puebla that it essentially is an extension of Puebla itself. Cholula has grown in recent years to over 118,000 people, which surprised me because Cholula feels smaller than it is. Cholula is home to a plethora of beautiful churches, of which the San Gabriel Monastery is surely the most impressive. The monasterio is a walled complex of several buildings, adorned in yellow stucco and white trim. The complex faces the town’s main square, which in turn is fronted by buildings featuring porticos and balconies. On a sunny day, Cholula really is magical. A short walk from the square leads to the region’s star attraction, the Great Pyramid of Cholula. 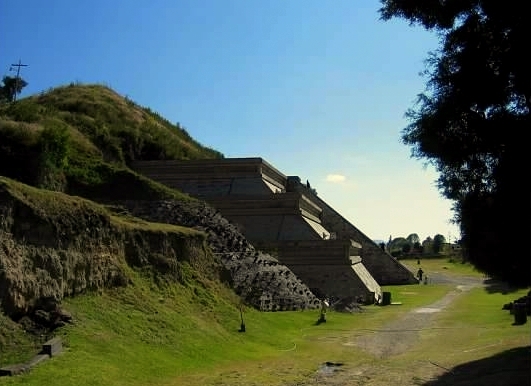 This Aztec site is still partially covered by a grassy hill, and from three angles you would hardly know that such a massive temple – the second largest pyramid on earth, bigger even than the Pyramid of the Sun at Teotihuacán – exists here. Somewhat remarkably, an L-shaped tunnel leads visitors through the pyramid’s bowels, exiting at the Patio of the Altars, the only fully-excavated corner of the pyramid. Even more remarkably, the hill that covers the pyramid is topped by a church, La Nuestra Señora de los Remedios (the Church of the Remedies). A tiring climb brings you to the top, where the views are stunning. Below lies the entirety of Cholula, with 5,426-meter (17,802-foot) Popocatépetl volcano towering over the backdrop. The still-active “Popo” emits a cloud of sulfurous smoke more often than not. It was while climbing the steps to the church that I tried chapulines for the first time. Fried grasshoppers, legs and all, are a tasty, crunchy snack. Cholula-brand hot sauce is optional. Vero and I sat on a level section of the hill as Papantla dancers climbed a pole and performed their dizzying Voladores ritual. Think of Turkey’s whirling dervishes spinning, trance-like…and picture them doing this while hanging upside down, suspended by their ankles. We returned to Puebla and enjoyed a late afternoon stroll from the regional bus station to the city central, stopping in nearly every church we came across. Puebla is famous for its talavera tilework, which originated in the state during the 16th century. 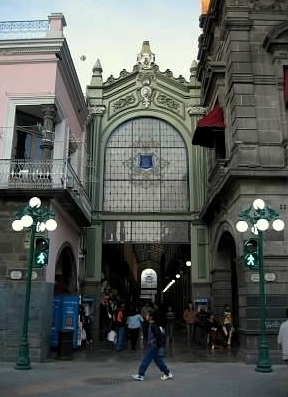 The specialized ceramic tile, made from a mix of black and white sand, adorns nearly every colonial building in Puebla, including the city’s churches. The evening’s events remain a blur to me, with one exception. It was a clear, warm night, and Vero and I enjoyed a slow stroll around the Centro Histórico. The sun set soon after 6 p.m., and we found ourselves lingering in a plaza that faces one side of Puebla’s cathedral. We had the plaza to ourselves. We held hands, smiled in each other’s direction, and said nothing. The only sounds were of birds settling in for the night in the plaza’s trees, and of an accordion player on the next block. The atmosphere seemed hard to beat, so I got down on one knee, produced an engagement ring, and asked Verónica to marry me. We had two more great days together. The first, in Puebla, saw us strolling around the city on a Sunday, when the cobblestone streets were alive with pedestrians and the courtyard in front of the cathedral was packed with families leaving church. A tranvía (tourist trolley) plied the downtown streets, and clowns doubled as balloon vendors for the young and the young at heart. We visited a large park on the edge of the city, Centro Cívico Cultural 5 de Mayo. 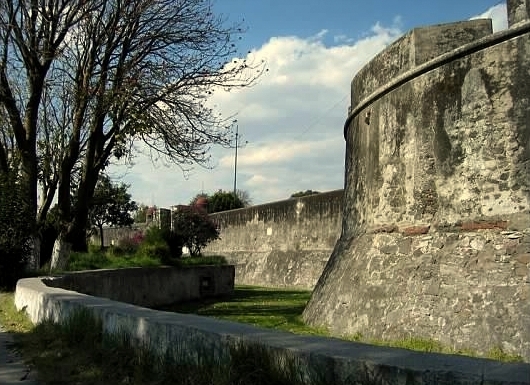 The park has a few museums and two historic forts that played a pivotal role in Mexico’s battle for independence from France on May 5, 1862. I like cannons and ramparts as much as the next history buff, but even so, the park doesn’t hold a candle to Mexico City’s Chapultepec or San Juan de Aragón. 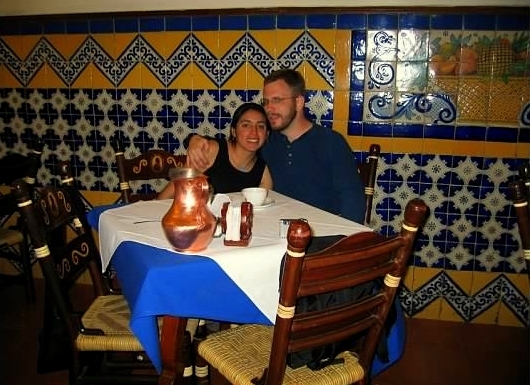 That evening, we returned to Mexico City for a farewell dinner at Sanborns, one of my favorite downtown restaurants. The Sanborns chain is owned by world’s richest man Carlos Slim, and for all of the people whom he likely stabbed in the back during his rise to the top, he is a generous humanitarian. Slim is almost single-handedly responsible for the rejuvenation of Mexico City’s Centro Histórico, and it is said that he owns dozens of buildings throughout the city…each of which houses a Sanborns restaurant and department store on its ground floor. I was supposed to fly back to Los Angeles at 8 a.m. the next morning, and even return to work that afternoon. Alas, neither event took place. We overslept; I will simply blame it on the fact that our downtown hotel room didn’t have any windows! I feel the same way about Mexico itself. Now it’s your turn, Loyal Reader. Do you travel long distances for the holidays? 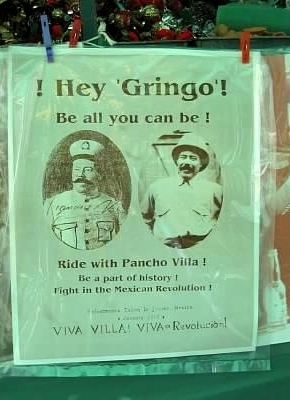 If you are a fellow gringo, how do you typically spend Thanksgiving? A lovely write-up. One thing stood out though: cerveza con vino? Never heard of it! hehe. Hubby and I don’t celebrate Thanksgiving. We give more importance to Christmas which we always spend together wherever we are living in the moment and I cook since we got married 5 years ago. Before that, I used to spend it back home in Mexico City. Nowadays I visit Mexico City in December before Christmas and my mom organizes a whole family (think aunts, uncles, their partners, cousins, etc) early Christmas get-together while I’m there. I’m traveling there next week for 10 days. I might fly down to Mexico City myself for a few days next month. Enjoy your visit and thanks for the kind words. Feliz Navidad! Yum, queso makes everything better haha. Feliz navidad to you too! Grasshoppers. ..yuck!! You should stick with cinnamon. No offense, Mrs. Lovett, but they are better than your meat pies. I make the best meat pies in the history of ever!! Could I interest you in a little priest? I’ve experienced many holidays far from home… New Year’s Eve in Izamál, Yucatan, Easter in Mexico City, July 4th in London, my birthday in Granada, Spain, and Christmas in Cancún. But Thanksgiving has always been spent close to home. 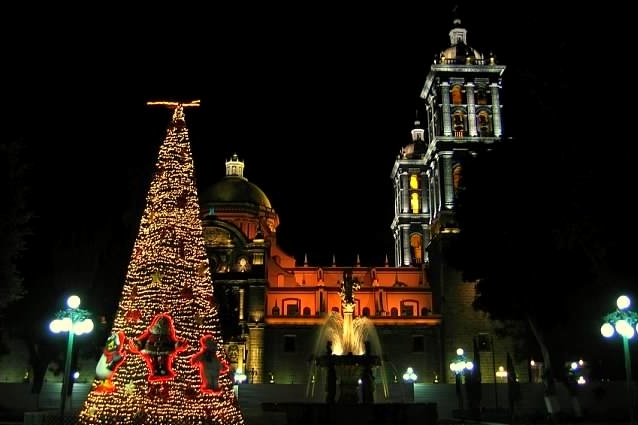 I enjoyed reading about your trip to Puebla and Cholula, since my first time in Mexico was to study at the University of the Americas in Cholula. We were told, however, that the pyramid in Cholula is THE biggest in the world, at least in terms of volume. Hey, thanks! What do you think of Puebla?